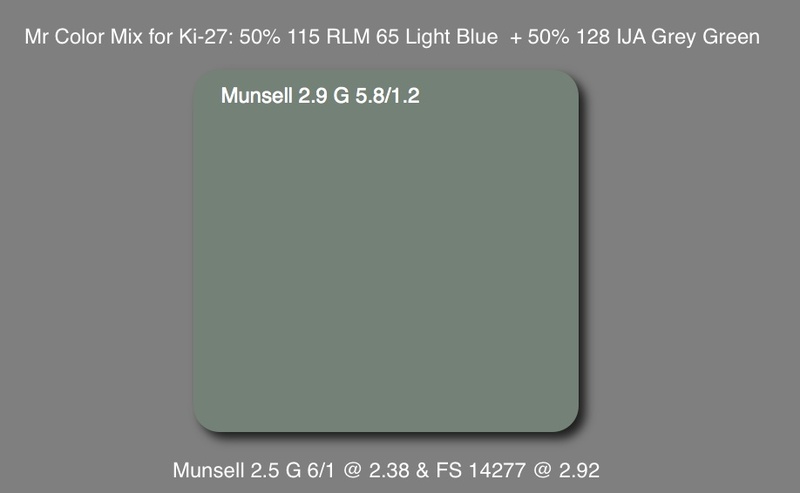 Recently Hasegawa have been suggesting a 50/50 mix of Mr Color 115 RLM 65 Light Blue and 128 IJA Grey Green for their Ki-27 kits (both 1/72nd and 1/48th scales). Not everyone has or can easily obtain Mr Color paints so I prepared the mix and then measured it using a photospectrometer. 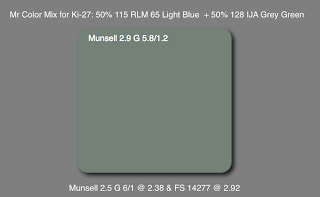 The resulting colour is Munsell 2.9 G 5.8/1.2 with the closest "standard" Munsell being 2.5 G 6/1 @ 2.38 (where less than 2.0 = a close match) and the closest FS 595B value being 14277 @ 2.92. 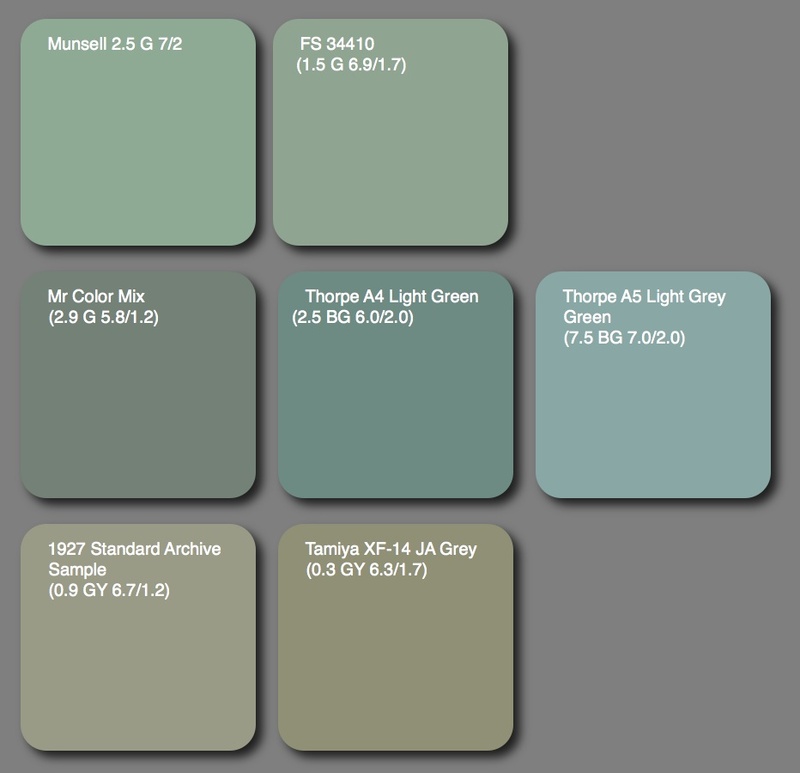 The latter has a stronger blue-green hue and is slightly darker, the mix being somewhat lighter and greyer. What is surprising about the mix is that it did not result in a more blueish colour as expected. It appears to represent a slightly darker blue-green version of JAAF #1 Hairyokushoku (ash green colour) and may be based on facsimile reproductions of the JAAF paint standards published by Gakken. 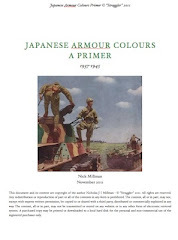 According to the Ki-27 factory manual in the Japanese Centre for Asian Historical Records Archive the original factory applied colour of the Ki-27 was a "sage green" paint described as "Mignonette". Mignonette is a genus of fragrant herbaceous plants native to the Mediterranean region and to southwest Asia, from the Canary Islands and Iberia east to northwest India, also known as Resada. Its colour is a pale yellowish blue-green or slightly blueish sage green. Rikyu Watanabe described the colour of the Ki-27 as "mei-hairyoku-shoku (IJA gray-green) - a glossy gray that has a very slight green tint". When the film "Aa Rikugun Hayabusa Kettoutai" was made in 1969 the Ki-27 replicas were depicted in a noticeably glossy pale blue green colour (the screen shots below over emphasise the blue). This colour could be described as a "traditional" (and older) representation of Army Hairyokushoku, much brighter and more blue-green in character than the likes of Mr Color 128 or Tamiya XF-14 suggest. 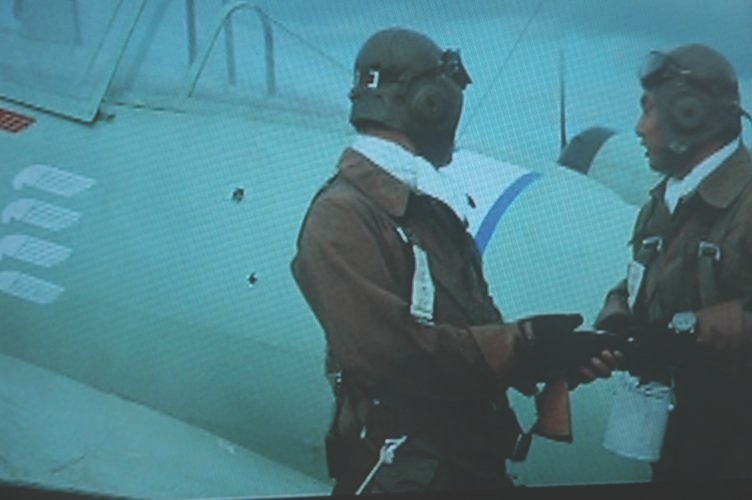 But more like the appearance seen in the Okinawa Ki-51 film. 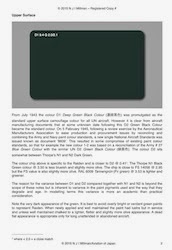 The colour is estimated to be similar to 2.5 G 7/2, something like FS 34410, stronger, brighter and lighter than Hasegawa's mix. 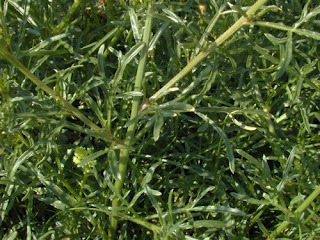 These pale blue-greens bear some resemblance to Thorpe's A4 Light Green and particularly A5 Light Grey Green but are bolder than the Hairyokushoku hobby paints. The problem is that the original paint surface would quickly succumb to oxidisation and chalking when exposed and unmaintained, resulting in a whitish-grey patina over the surface that would conceal any hint of blue-green subtlety in the original paint colour. Also extant samples have probably darkened and yellowed slightly with age. Unfortunately I don't have a measured value for Mr Color 128 but it is similar to XF-14, slightly greyer, slightly less green and rather like a somewhat duller, greyer version of FS 34424 (which is often cited for RAF Sky). 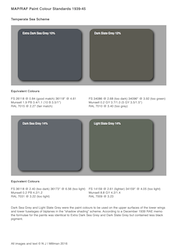 These descriptions are relative, as are the paint colours when seen in juxtaposition to each other as above. 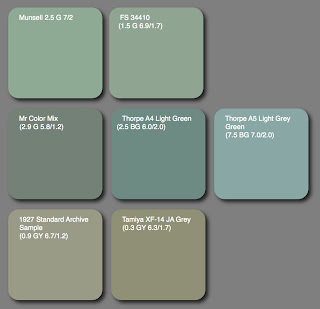 The paint colours 128 and XF-14 look inherently brighter away from the strong pale blue-greens shown here. They both seem to have been based on the 1927 archive sample. Can these variances be resolved? Not really. But the original Hess-Ives values for the authorised colour range of JAAF # 1 do reveal a remarkable variance from a strong, bright pale blue-green to a much duller olive grey. Rather than fret over the variances, enjoy them. 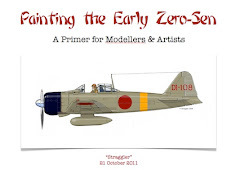 In yesterday's blog post on RS Models re-released Ki-60 I mentioned that the photo-etch sheet is pre-painted. It is not. It is plain brass. 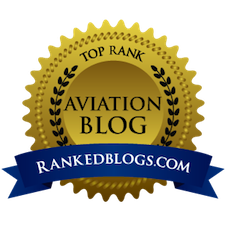 I have amended the original blog accordingly. Having examined the kit more closely I discovered that the numbers engraved on the photo-etch sheet bear no relationship to the photo-etched parts numbers shown in the instruction sheet! There is a schematic on the instruction sheet with the "correct" numbers that re-pays careful study. Image credits: Box art © 2002 Hasegawa; Rendered color chips © 2010 Straggler; Mignonette (Resada) author's collection; "Aaa Rikugun Hayabusa Ketouttai" images © 1969 Kadokawa Herald Pictures Inc. I have two or three metal relic samples from one or more of the Nakajima Type 97 Fighter. 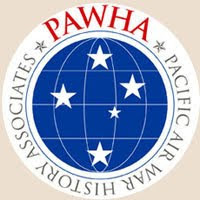 One sample was souveniered by AVG pilot Frank LAWLOR (wingman to Tex HILL) and another piece from a different AVG pilot. Both appear to have been taken from the same Type 97 wreckage of a No.77 Hiko Sentai bird. I also have some color readings from the fabric tail surfaces of a rudder souvenierd from a No.77 Hiko Sentai Type 97 Fighter formerly at the CHAMPLIN Fighter Museum, Falcon Field, Phoenix, AZ. I'll dig these item out of research mess and get fresh readings and e-mail these readings to you if you wish. The metal surfaces were an olive-gray (similar to the Tamiya XF-14 JA Grey) similar to the color found on the metal surfaces of the early Nakajima-constructed Zeros and the fabric was definitely more blue-gray ... again, as found on the early Zeros. I will try to send you one relic-sample so that you can do your separate color analysis on your side of the pond. 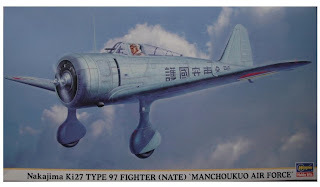 New Japanese Aircraft in 1/72nd!